Urban runoff is a major cause of urban flooding, the inundation of land or property in a built-up environment caused by rainfall overwhelming the capacity of drainage systems, such as storm sewers. Triggered by events such as flash flooding, storm surges, overbank flooding, or snow melt, urban flooding is characterized by its repetitive, costly and systemic impacts on communities, regardless of whether or not these communities are located within formally designated floodplains or near any body of water. There are several ways in which stormwater enters properties: backup through sewer pipes, toilets and sinks into buildings; seepage through building walls and floors; the accumulation of water on property and in public rights-of-way; and the overflow of water from water bodies such as rivers and lakes. Where properties are built with basements, urban flooding is the primary cause of basement flooding. Flood flows in urban environments have been investigated relatively recently despite many centuries of flood events. Some researchers mentioned the storage effect in urban areas. Several studies looked into the flow patterns and redistribution in streets during storm events and the implication in terms of flood modelling. Some recent research considered the criteria for safe evacuation of individuals in flooded areas. But some recent field measurements during the 2010–2011 Queensland floods showed that any criterion solely based upon the flow velocity, water depth or specific momentum cannot account for the hazards caused by the velocity and water depth fluctuations. These considerations ignore further the risks associated with large debris entrained by the flow motion. Water running off these impervious surfaces tends to pick up gasoline, motor oil, heavy metals, trash and other pollutants from roadways and parking lots, as well as fertilizers and pesticides from lawns. Roads and parking lots are major sources of polycyclic aromatic hydrocarbons (PAHs), which are created as combustion byproducts of gasoline and other fossil fuels, as well as of the heavy metals nickel, copper, zinc, cadmium, and lead. Roof runoff contributes high levels of synthetic organic compounds and zinc (from galvanized gutters). Fertilizer use on residential lawns, parks and golf courses is a measurable source of nitrates and phosphorus in urban runoff when fertilizer is improperly applied or when turf is over-fertilized. Eroding soils or poorly maintained construction sites can often lead to increased sedimentation in runoff. Sedimentation often settles to the bottom of water bodies and can directly affect water quality. Excessive levels of sediment in water bodies can increase the risk of infection and disease through high levels of nutrients present in the soil. These high levels of nutrients can reduce oxygen and boost algae growth while limiting native vegetation growth. Limited native vegetation and excessive algae has the potential to disrupt the entire aquatic ecosystem due to limited light penetration, lower oxygen levels, and reduced food reserves. Excessive levels of sediment and suspended solids have the potential to damage existing infrastructure as well. Sedimentation can increase runoff by plugging underground injection systems, thereby increasing the amount of runoff on the surface. Increased sedimentation levels can also reduce storage behind reservoirs. This reduction of reservoir capacities can lead to increased expenses for public land agencies while also impacting the quality of water recreational areas. As stormwater is channeled into storm drains and surface waters, the natural sediment load discharged to receiving waters decreases, but the water flow and velocity increases. In fact, the impervious cover in a typical city creates five times the runoff of a typical woodland of the same size. A 2008 report by the United States National Research Council (textbox below) identified urban runoff as a leading source of water quality problems. ...further declines in water quality remain likely if the land-use changes that typify more diffuse sources of pollution are not addressed... These include land-disturbing agricultural, silvicultural, urban, industrial, and construction activities from which hard-to-monitor pollutants emerge during wet-weather events. Pollution from these landscapes has been almost universally acknowledged as the most pressing challenge to the restoration of waterbodies and aquatic ecosystems nationwide. The runoff also increases temperatures in streams, harming fish and other organisms. (A sudden burst of runoff from a rainstorm can cause a fish-killing shock of hot water.) Also, road salt used to melt snow on sidewalks and roadways can contaminate streams and groundwater aquifers. One of the most pronounced effects of urban runoff is on watercourses that historically contained little or no water during dry weather periods (often called ephemeral streams). When an area around such a stream is urbanized, the resultant runoff creates an unnatural year-round streamflow that hurts the vegetation, wildlife and stream bed of the waterway. Containing little or no sediment relative to the historic ratio of sediment to water, urban runoff rushes down the stream channel, ruining natural features such as meanders and sandbars, and creates severe erosion—increasing sediment loads at the mouth while severely incising the stream bed upstream. As an example, on many Southern California beaches at the mouth of a waterway, urban runoff carries trash, pollutants, excessive silt, and other wastes, and can pose moderate to severe health hazards. Because of fertilizer and organic waste that urban runoff often carries, eutrophication often occurs in waterways affected by this type of runoff. After heavy rains, organic matter in the waterway is relatively high compared with natural levels, spurring growth of algae blooms that soon consume most of the oxygen. Once the naturally occurring oxygen in the water is depleted, the algae blooms die, and their decomposition causes further eutrophication. Algae blooms mostly occur in areas with still water, such as stream pools and the pools behind dams, weirs, and some drop structures. Eutrophication usually comes with deadly consequences for fish and other aquatic organisms. 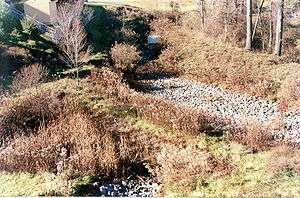 Excessive stream bank erosion may cause flooding and property damage. For many years governments have often responded to urban stream erosion problems by modifying the streams through construction of hardened embankments and similar control structures using concrete and masonry materials. Use of these hard materials destroys habitat for fish and other animals. Such a project may stabilize the immediate area where flood damage occurred, but often it simply shifts the problem to an upstream or downstream segment of the stream. See River engineering. Urban flooding has significant economic implications. In the US, industry experts estimate that wet basements can lower property values by 10%-25% and are cited among the top reasons for not purchasing a home. According to the U.S Federal Emergency Management Agency (FEMA), almost 40% of small businesses never reopen their doors following a flooding disaster. In the UK, urban flooding is estimated to cost £270 million a year in England and Wales; 80,000 homes are at risk. A study of Cook County, Illinois, identified 177,000 property damage insurance claims made across 96% of the county’s ZIP codes over a five-year period from 2007-2011. This is the equivalent of one in six properties in the County making a claim. Average payouts per claim were $3,733 across all types of claims, with total claims amounting to $660 million over the five years examined. Despite concerted efforts, many communities lack the funds to fully address these issues, and often seek funds elsewhere. Numerous watersheds within Los Angeles County, California do not meet state water quality standards, despite spending $100 million a year on clean water programs to combat issues such as urban runoff. To combat this problem, officials have introduced a measure that would assess a fee to homeowners and local businesses in attempt to raise $290 million for effective urban runoff management. A percolation trench infiltrates stormwater through permeable soils into the groundwater aquifer. Effective control of urban runoff involves reducing the velocity and flow of stormwater, as well as reducing pollutant discharges. A variety of stormwater management practices and systems may be used to reduce the effects of urban runoff. Some of these techniques (called best management practices (BMPs) in the US), focus on water quantity control, while others focus on improving water quality, and some perform both functions. Pollution prevention practices include low impact development or green infrastructure techniques, such as the installation of green roofs and improved chemical handling (e.g. management of motor fuels & oil, fertilizers and pesticides). Runoff mitigation systems include infiltration basins, bioretention systems, constructed wetlands, retention basins and similar devices. Providing effective urban runoff solutions often requires proper city programs that take into account the needs and differences of the community. Factors such as a city’s mean temperature, precipitation levels, geographical location, and airborne pollutant levels can all effect rates of pollution in urban runoff and present unique challenges for management. Human factors such as urbanization rates, land use trends, and chosen building materials for impervious surfaces often exacerbate these issues. 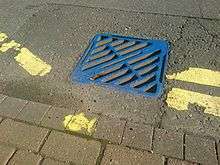 The implementation of city wide maintenance strategies such as street sweeping programs can also be an effective method in improving the quality of urban runoff. Street sweeping vacuums collect particles of dust and suspended solids often found in public parking lots and roads that often end up in runoff. Educational programs can also be an effective tool for managing urban runoff. Local businesses and individuals can have an integral role in reducing pollution in urban runoff simply through their practices, but often are unaware of regulations. Creating a productive discussion on urban runoff and the importance of effective disposal of household items can help to encourage environmentally friendly practices at a reduced cost to the city and local economy. 1 2 Water Environment Federation, Alexandria, VA; and American Society of Civil Engineers, Reston, VA. "Urban Runoff Quality Management." WEF Manual of Practice No. 23; ASCE Manual and Report on Engineering Practice No. 87. 1998. ISBN 1-57278-039-8. Chapter 1. ↑ Schueler, Thomas R. (2000) [initial publ. 1995]. "The Importance of Imperviousness" (pdf). In Schueler; Holland, Heather K. The Practice of Watershed Protection. Ellicott City, MD: Center for Watershed Protection. pp. 1–12. Retrieved 2014-12-24. 1 2 Brown, Richard; Chanson, Hubert; McIntosh, Dave; Madhani, Jay (2011). "Turbulent Velocity and Suspended Sediment Concentration Measurements in an Urban Environment of the Brisbane River Flood Plain at Gardens Point on 12–13 January 2011". Hydraulic Model Report No. CH83/11. Brisbane, Australia: The University of Queensland, School of Civil Engineering (CH83/11): 120 pp. ISBN 978-1-74272-027-2. ↑ Werner, MGF; Hunter, NM; Bates, PD (2006). "Identifiability of Distributed Floodplain Roughness Values in Flood Extent Estimation". Journal of Hydrology. 314: 139–157. doi:10.1016/j.jhydrol.2005.03.012. ↑ G. Allen Burton, Jr., Robert Pitt (2001). Stormwater Effects Handbook: A Toolbox for Watershed Managers, Scientists, and Engineers. New York: CRC/Lewis Publishers. ISBN 0-87371-924-7. CS1 maint: Uses authors parameter (link) Chapter 2. 1 2 Protecting Water Quality from Urban Runoff (Report). EPA. February 2003. EPA 841-F-03-003. ↑ National Research Council (United States) (2009). Urban Stormwater Management in the United States (Report). Washington, D.C.: National Academies Press. p. 24. doi:10.17226/12465. ISBN 978-0-309-12539-0. ↑ United States Geological Survey. Atlanta, GA. "The effects of urbanization on water quality: Urban runoff." Accessed 2009-12-30. ↑ Laws, Edward A.; Roth, Lauren (2004). "Impact of Stream Hardening on Water Quality and Metabolic Characteristics of Waimanalo and Kane'ohe Streams, O'ahu, Hawaiian Islands". Pacific Science. University of Hawai'i Press. 58 (2). doi:10.1353/psc.2004.0019. ISSN 0030-8870. hdl:10125/2725. ↑ "Ch. 3. Channelization and Channel Modification". National Management Measures to Control Nonpoint Source Pollution from Hydromodification (Report). EPA. 2007. EPA 841-B-07-002. 1 2 “The Prevalence and Cost of Urban Flooding.” May 2013, Center for Neighborhood Technology, Chicago IL. ↑ Sewell, Abby (2013-01-03). "County seeks parcel fee to pay for projects to combat urban runoff". Los Angeles Times. ↑ "Ch. 5: Description and Performance of Storm Water Best Management Practices". Preliminary Data Summary of Urban Storm Water Best Management Practices (Report). Washington, D.C.: U.S. Environmental Protection Agency (EPA). August 1999. EPA-821-R-99-012. ↑ Reduce Runoff: Slow It Down, Spread It Out, Soak It In (Video). EPA. 2009. ↑ California Stormwater Quality Association. Menlo Park, CA. "Stormwater Best Management Practice (BMP) Handbooks." 2003. ↑ "Parking Lot and Street Cleaning". National Menu of Stormwater Best Management Practices. EPA. Archived from the original on 2015-08-28. Retrieved 2014-12-24. ↑ Ballo, S., Liu, M., Hou, L., & Chang, J. (2009). Pollutants in stormwater runoff in Shanghai (China): Implications for management of urban runoff pollution. Progress in Natural Science, 19(7), 873-880. Wikimedia Commons has media related to Stormwater management and Urban runoff. Harry C. Torno; Jiri Marsalek; Michel Desbordes, eds. (1986). Urban Runoff Pollution. Berlin: Springer-Verlag. ISBN 3-540-16090-6.